- the idea that justice is a contested concept among both religious and secular actors which requires some sort of ‘faith’ from its proponents. These chapters transcend simplistic either/or binaries highlighting the difficulties of clearly distinguishing between religious and secular, progressive and conservative, or rational and irrational motives and norms in struggles for justice. Challenging the secularization paradigm that marginalizes the role religious actors play in public life these chapters show how these actors engage with a broad range of justice issues, how deeply contested justice is, and how its meaning may vary and change among religious actors as a result of the social or political context within which an injustice is encountered. The chapters originally published as a special issue in Globalizations. Peter J. Smith is Professor of Political Science at Athabasca University, Alberta, Canada. His current research interests include new communication technologies, globalization, religion, trade politics, transnational networks, democracy, and citizenship. 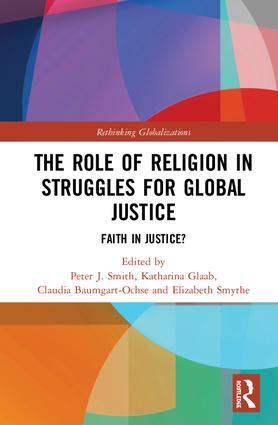 He is the co-editor with Sabine Dreher of Religious activism in the global economy: Promoting, reforming, or resisting neoliberal globalization? (2016). Katharina Glaab is an Associate Professor in Global Change and International Relations at the Department of International Development and Environment Studies at the Norwegian University of Life Sciences. Her research and teaching revolves around questions of normative change and the politics of knowledge. She has published on norms in International Relations, conflicts around agricultural biotechnology in China and India, faith actors and climate change, and critical research on power. Claudia Baumgart-Ochse is a senior research fellow at the Peace Research Institute Frankfurt, Germany. She holds a PhD from Frankfurt University. Her research interests include the Middle East conflict and its religious dimensions as well as the role of religious non-state actors in global governance. Currently, she co-directs a research project on religious NGOs in the United Nations, funded by the German Research Foundation. Elizabeth Smythe is a Professor of Political Science and coordinator of the Political Economy Program at Concordia University of Edmonton, Alberta, Canada. Her research interests include international trade and investment agreements, food standards, social movements, and the WSF. She is a co-editor of the Handbook of World Social Forum activism (2012).